The Defense Information Systems Agency’s (DISA’s) present and future industry partners joined the agency for Forecast to Industry on November 5 at the BWI Airport Marriott Hotel and Conference Center in Linthicum, Maryland. The event provided industry representatives with in-depth information about the agency’s upcoming acquisition and procurement plans, and also offered a forum to collaborate with DISA in defense of the nation. The theme for this year’s event, “Trusted Partnerships,” paralleled DISA Director Navy Vice Admiral Nancy Norton’s strategic vision for DISA: To be the trusted provider to connect and protect the warfighter in cyberspace. Norton stressed to industry partners the importance of an integrated relationship during her opening remarks. “As the old saying goes, there is strength in numbers,” she said, reflecting on a recent speech by Secretary of Defense Jim Mattis. She described DISA’s role in defending national interests and acknowledged it takes a team effort to maximize the effect. The admiral continued her opening remarks by highlighting how the agency executes the defense secretary’s lines of effort. She talked about how the agency is increasing lethality for the warfighter, strengthening partnerships, and reforming the department. Norton highlighted a handful of initiatives the agency is working on, and her remarks were followed by detailed briefings from subject matter experts later in the day. She closed her remarks to the approximately 2,000 in-person and online attendees by reminding industry partners the agency is open to collaboration, and she welcomed them to the conversation. “Creating trusted partnerships supports DISA’s vision to be the trusted provider to connect and protect the warfighter in cyberspace,” she said. “I want you to share that vision and our values — to ensure success in defense of our nation. Department of Defense Chief Information Officer (CIO) Dana Deasy followed Norton’s opening remarks, and also emphasized the importance of DoD’s synchronized partnership with industry. Deasy explained how DISA’s portfolio is expanding to meet 21st Century challenges, highlighting two mobile apps used in support of Hurricane Florence emergency management and recovery efforts. At the Army’s request, DISA expedited security review and release of the “Ready North Carolina” app within the DoD Mobility Unclassified Capability (DMUC) app store. DISA and the South Carolina National Guard also worked together to create an app used by guardsmen to determine if their homes were in an evacuation zone. The app provided ease of mind to the emergency workers because they knew their families could access updated information and were able to find a safe place for evacuation, Deasy explained. Deasy continued his remarks to industry by reiterating the defense secretary’s three lines of effort and said every mission in DISA’s portfolio ties back to those objectives. He also said the agency is inherently tied to industry in this undertaking. “The challenges we face at DoD will continue to evolve, but when I look across the room today, I know the department does not face these challenges alone,” Deasy said. DISA’s Executive Deputy Director Tony Montemarano then gave attendees a DISA overview presentation. He presented DISA’s leadership hierarchy, and talked about how the agency provides niche services that support combatant commands and the warfighter, including joint interoperability testing, electromagnetic spectrum management, communications support for the White House and national leadership, desktop support at the Pentagon, and contracting. Montemarano, who is also DISA’s senior procurement executive, stressed the agency is vigilant when it comes to Other Transaction Authorities and contracting. He asked industry partners not to be discouraged or frustrated by the time it takes to execute a contract, and explained the time invested is beneficial to all involved. He said not only are procurements double-checked, they’re triple-checked. DISA Operations Center Director David Bennett took to the podium to discuss his center’s needs, stressing industry partners must understand his mission and work within that scope when proposing a solution for DISA and the DOD. Presentations continued throughout the afternoon. Presenters discussed the procurement and acquisition plans related to business innovation, cyber, mobility, networking, the Joint Service Provider, and small business programs. The event concluded with a “meet the seniors” panel. Dynetics has been selected to develop small satellites for the U.S. Army Space and Missile Defense Command/Army Forces Strategic Command (USASMDC/ARSTRAT) Technical Center program named Gunsmoke-L. Through the Design, Development, Demonstration and Integration (D3I), Domain 1 task order, the Gunsmoke-L contract is for two years, plus one option year valued at $8.3 million, to develop, test, integrate and demonstrate two tactical space support vehicles (TSSVs) which will be used to enhance all phases of joint force operations. The smallsat-based platforms will host the next generation of tactical space support payloads designed to operate in LEO for a minimum of two years. Dynetics will conduct hardware-in-the-loop testing and simulation in conjunction with the command’s Payload Development Laboratory (PDL) facility at Redstone Arsenal in Huntsville, Alabama, to optimize TSSV performance and reliability. The TSSV will be developed and integrated at Dynetics’ facilities in Huntsville, which include payload development labs, clean rooms and environmental test capabilities. At completion of the two-year base period, the two TSSVs will be qualified and ready for launch. During the 12 month option period, Dynetics will support on orbit demonstrations using the Technical Center’s smallsat ground control system located at Redstone Arsenal to provide command, control, and communication with the TSSV. Dynetics will work with the Technical Center’s Space and Strategic Systems Directorate, which serves as the developmental spearhead for the command’s advanced Army space support efforts, which include research, development and demonstration of the next generation of tactical space support payloads. Rohde & Schwarz presented their portfolio of integrated communications and radio reconnaissance solutions at INDO DEFENCE in Jakarta. This Rohde & Schwarz solution provides red/black separation in single security networks supported by high-quality encryption devices. Image is courtesy of Rohde-Schwarz. Rohde & Schwarz presented themselves as a single-source supplier of integrated solutions for secure communications and radio intelligence. 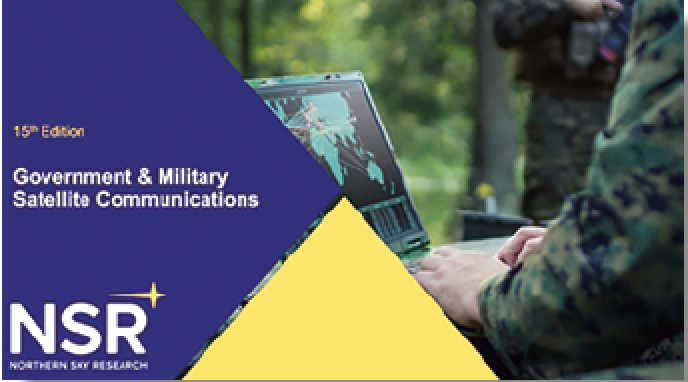 Interoperable, powerful communications systems for deployment on land, in the air and at sea are the cornerstones of the comprehensive communications architecture developed by the independent company. The R&S NAVICS integrated naval communications system delivers mission-ready internal and external voice and data communications for all classes of ships. The broad communications portfolio from Rohde & Schwarz is built around advanced software defined radios (SDR) based on software communications architecture (SCA). The latest generation of SDR/SCA technology is already fielded with the R&S SDTR for vehicle-based tactical communications and the R&S SDHR for highly mobile applications. Rohde & Schwarz presented their latest addition to its communications portfolio: the R&S SDAR next generation airborne radio. It combines the advantages of a networked radio with the excellent performance of the successful R&S M3AR family of airborne radios. Almost 8,000 software defined airborne radios from Rohde & Schwarz are integrated on more than 70 different airborne platforms. Turnkey COMINT/C-ESM systems from Rohde & Schwarz. Another highlight on display was the R&S ELINT solution. Created with a focus on user-friendliness and comprehensive functionality, the system is optimized for detecting, monitoring and analyzing advanced radar signals. 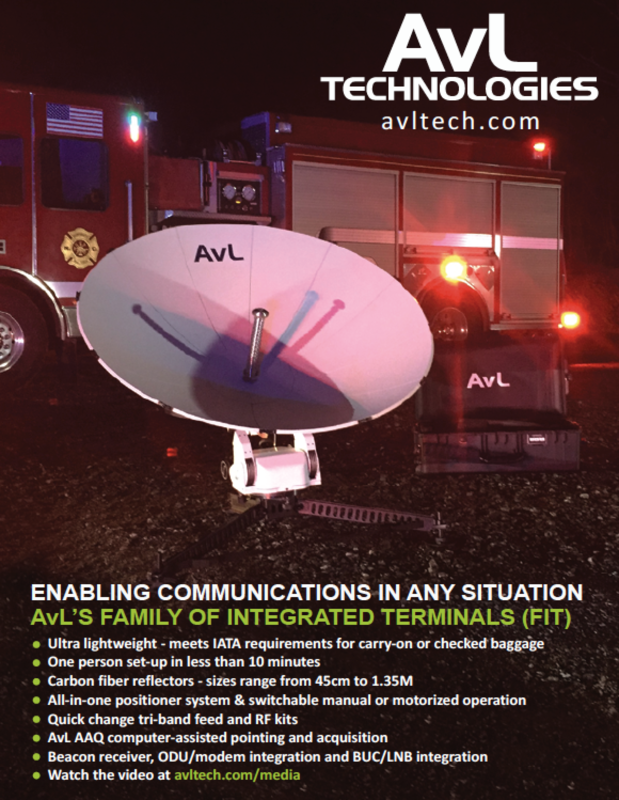 It was designed to handle challenging signal scenarios and has already proven itself in operation, especially in acquiring weak and LPI signals in dense signal environments and analyzing state-of-the-art, multi-functional radars with complex signal structures. Rohde & Schwarz will also showcase its COMINT/C-ESM solutions, which can be fully customized to meet the requirements of the most diverse intelligence missions. These radio monitoring systems from Rohde & Schwarz are deployed worldwide in land-based mobile and stationary applications and on naval and airborne platforms. The Rohde & Schwarz monitoring and direction finding systems are ideal for stationary, mobile and portable deployment. The R&S DDF1555 is the heart of a full-featured man-portable reconnaissance system for outdoor applications. It combines accurate direction finding with wideband monitoring capabilities. The direction finder is an ideal solution for applications that require portable and mobile direction finders for use in outdoor environments. The Rohde & Schwarz portfolio also offered a number of solutions for protecting cyberspace. The security of data and communications is the prerequisite for the success of digital transformation, which affects almost all facets of the economy and society. The explosive growth of networked products makes it easier to launch a digital attack on companies, authorities and critical infrastructures. For their protection, Rohde & Schwarz Cybersecurity, using the security-by-design approach, develops and produces a wide range of leading high-tech hardware and software products that repel attacks proactively instead of reactively. Harris Corporation (NYSE:HRS) has now provided Lockheed Martin (NYSE:LMT) with the sixth of 10 advanced navigation payloads contracted for the U.S. Air Force’s GPS III satellite program. The GPS III navigation payload features a Mission Data Unit (MDU) with a unique 70-percent digital design that links atomic clocks, radiation-hardened processors and powerful transmitters — enabling signals three times more accurate than those on current GPS satellites. The payload also boosts signal power, which increases jamming resistance by eight times and helps extend the satellite’s lifespan. Harris is committed to delivering a seventh navigation payload by the end of 2018. This latest payload delivery is the third payload Lockheed Martin has received in the last 12 months. Harris navigation payloads are already integrated on five GPS III satellites. In August, the first GPS III space vehicle (GPS III SV01) shipped to Florida for an expected December launch. Also, in August, the Air Force declared GPS III SV02 Available for Launch, or “AFL,” for an expected 2019 launch. GPS III SV03 and SV04 are fully assembled and in environmental testing. GPS III SV05 was integrated with its payload this fall and will begin system testing later this year. NSR’s newly released Government and Military Satellite Communications, 15th Edition report finds a rebounding market entering a growth phase after several years of stagnation. Geopolitics, acquisition reform, and expanded low-cost offerings from the commercial market, all point to expanded opportunities across all regions and applications. 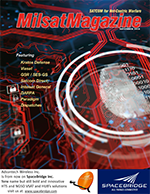 With more than $71 billion in cumulative revenue expected by 2027, commercial suppliers to the MILSATCOM market stand to see sizable gains. At slightly over $5 billion in revenues in 2017, up nearly $500 million from 2016, annual global MILSATCOM revenue will double over the next decade. Land-Mobile and UAS applications are the leading markets for Government and Military users, as they will generate over 64 percent of revenue. 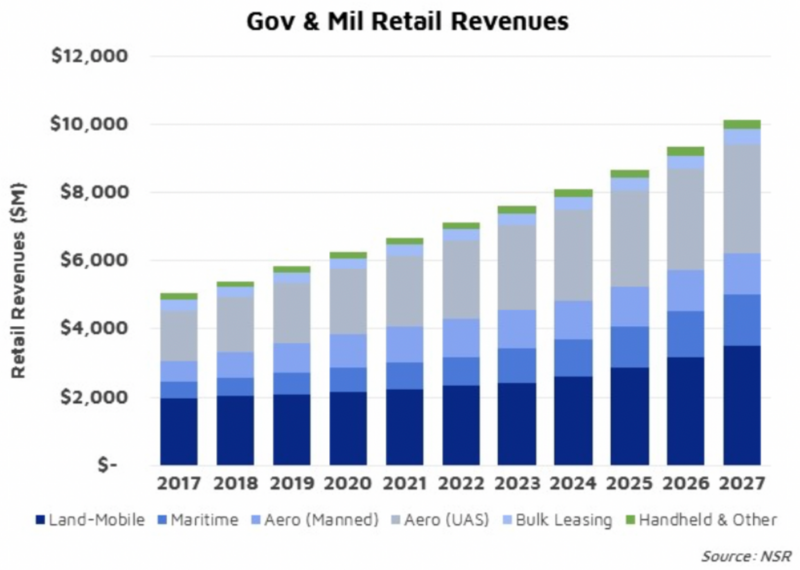 Renewed interest in bulk leasing, and ongoing integration of commercial managed services into end-user networks, however, is being offset by challenges in terminal acquisition and expanding MILSATCOM capacity. “Government and Military customers need more connectivity than ever before — from all orbits, and frequencies — and from both commercial and proprietary networks,” said report author and Senior Analyst, Brad Grady. Brady note, “The debate today isn’t entirely MILSATCOM vs. COMSATCOM, it’s about acquiring new, flexible terminals, and having a holistic view of the entire communications infrastructure. As commercial markets continue to accelerate their uptake of broadband satellite connectivity, these end-users are feeling the pressures of being left behind. Combined with falling capacity prices, Government and Military markets are taking full advantage of accelerating their adoption of commercial satellite connectivity. At over 21 Gbps of capacity demand across both FSS and HTS in 2017, increasing to more than 250 Gbps of satellite capacity by 2027, generating $10 billion in retail revenues for the satellite sector, the market is on a growth-trajectory. Despite several years of turbulence, there is a strong outlook for mil/gov satcom growth on the horizon. NSR’s Government and Military Satellite Communications, 15th Edition, explores the market opportunities available to the satellite industry. With more than 15 years of insights and analysis, NSR’s longest-running report on the government and military satellite communications market provides an in-depth view of the drivers, regional trends, and capacity demand through 2027. Viasat’s Mini Crypto to U.S.A.F. In today’s battlespace environment, technological breakthroughs have enabled smaller sensors and smaller platforms of every kind, but until now, the available high-assurance cryptographic technology did not meet the needs for these devices at the tactical edge. Viasat’s Mini Crypto devices are designed for easy embedment on U.S. Department of Defense (DoD) small form factor systems, allowing them to transmit SECRET and Below data securely across the battlespace. Systems include unmanned systems, emerging robotics applications, communications devices, and existing and emerging sensors. According to the USAF, the Mini Crypto device will enable forward-deployed warfighters to secure these small, tactical edge systems in extremely hostile environments. The Mini Crypto device will ensure tactical communications and data exchanges, no matter where they take place, stay safe and secure. Due to its small size and embedded operational use case, the Mini Crypto device provides high levels of security with minimal additional weight and power. In addition, because they are embedded and have a self-contained encryption engine capable of generating their own keys, they are not required to undergo the same special handling as other security devices, thereby expanding their operational use case and reducing operational costs. The initial LRIP order of Viasat’s Mini Crypto devices demonstrates a critical transition point for this embeddable security technology, and is a key step towards securing a Full-Rate Production order from the USAF. First deliveries of Viasat’s Mini Crypto devices are expected during the third quarter of Viasat’s fiscal year. Ken Peterman, President, Government Systems, Viasat, said that cyber threats have created a new operational environment and have increased risk across the multi-domain battlespace. Viasat’s Mini Crypto will provide substantial operational cost savings to customers through certificate-based Tactical Key Management and non-Controlled Cryptographic Item handling. He added that the Mini Crypto also brings exceptional ease-of-use to the warfighter with innovations in low Size Weight and Power, enabling longer operational periods and smaller payloads. The company’s patented software is upgradable even after deployment, enabling ongoing improvements without removing the system from the field.